IS THE GROUND IN YOUR backyard uneven? Does it tend to collect water right where you plan to build your shed? If you answered yes to either of these questions, then building a pier foundation might be for you. Since most sheds have a wooden floor, keeping it out of the water is an important part of making your shed last as long as possible. Building a shed in a place that you know is regularly damp may also void your warranty if you buy yourself a shed kit. 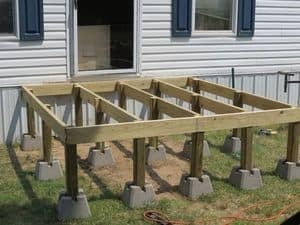 This article will help you with pier basics, including the different types of common pier foundations found, the tools and supplies you need as well as how to build a good shed foundation with piers. Before you set out to build your pier foundation or add a shed to your backyard, the first thing you need to do is check the rules. Most localities have their own regulations regarding how your shed's foundation can be built, what type of materials can be used, and the size and location of your shed. The good news is that if you are building a small shed then there is unlikely to be any requirements from the permit office (you can use a map to find your local permit office online, and see their requirements here). If you don’t take the time to figure out the rules before you get started, you may find yourself tearing it all down and starting over. At the same time, you might find yourself paying a relatively large fine for doing it wrong in the first place. 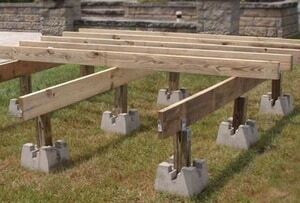 There are two common types of piers use to build shed foundation, treated lumber posts, and concrete. The number of piers needed to properly support your shed is based on the overall size of the shed you plan to build. The concrete piers with a pre-attached wood nailer must be buried into the ground, while the lumber ones must be placed in a hole and secured in place with cement. The most common of these is the latter, typically made from pressure treated 4 x 4 lumber that is set in concrete creating a strong foundation for your shed. However, both styles can be used with equal success. The rest of it lies in how well you do the job of laying your foundation. Gravel – to lay in the bottom of the pier holes in the ground. 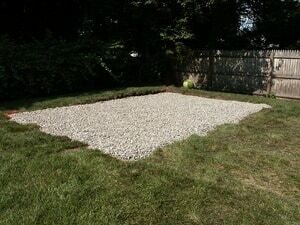 The first step in laying a pier foundation is to prepare the ground where your shed is going to sit. Carefully scrape away any grass, roots, or debris to expose the soil. If the area does not drain properly consider digging down approximately 4 to 6 inches and filling the area with pea gravel. This will help to improve overall drainage. Start by marking out the perimeter of your shed, use stakes to mark the corners and run string between them. At each point where the lines of your grid intersect is where you will be placing the piers. Now that you know how many piers will be needed, you can buy the right number of premade concrete and wood piers or the correct amount of lumber and cement. Now that you have a map of where you plan to lay the piers on paper, it's time to mark out the locations on the ground. There are a couple of ways you can do this. First, you can run strings along the ground to create the same grid pattern you have on paper and use the points at which they intersect to mark the spot (similar in many ways to “X” marks the spot. Alternatively, you can measure each location carefully and use spray paint to mark the locations. However, this method may not be as accurate as the crossed string method above. No matter which of these methods you choose, take your time. Accuracy is of the utmost importance at this point if you want your shed to be properly supported no matter what you plan to store in it. With all pier locations marked on the ground, it's time to dig in, literally. Grab your favorite leather work gloves and your favorite shovel, you have a lot of digging to do. Each hole should be 12 inches in diameter and should be dug down at least 12 inches below the frost line in your area. If you are not sure where this line is, you can ask your local city regulatory board, they should have the information for you. Make the holes round instead of square as cylindrical shapes offer far more support than square ones. If you look at many of today's bridges, they feature round piers for support. This follows along the same basic concept. Pour 4 to 6 inches of gravel into the bottom of each hole and tamp it down. This will create a firm foundation for the wood or concrete piers. If you are using pre-made concrete and wood piers, you can simply set them in the hole and fill in the holes around them. Once the foundation is attached, they are not going to move. If you plan to use wood piers, place each pier in a hole, pour cement that has been mixed according to the instructions into the hole so that the hole is filled almost to the top. At this point, you need to attach a pair of 2x4s to the pier and use your level to ensure the pier remains perfectly upright while the cement sets up. This is perhaps the most important step of the entire process. Piers that are not perfectly set can have a major negative impact on how level and well-supported your shed will be. 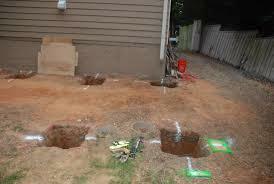 If you are using pre-made piers, you need to check for level as you are adding the soil back into the hole. You may even want to use smaller rocks and gravel to help add more support and stability for the piers. 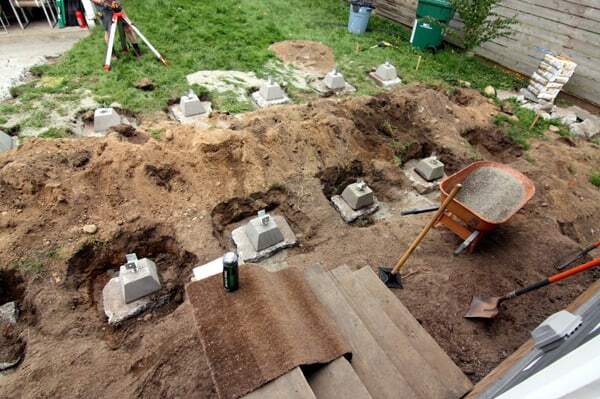 Before you move on to the next phase, adding the foundation, you need to give the cement plenty of time to set. It takes an average of 24 hours for the properly mixed cement to become hard enough to walk on. But it takes approximately 28 days for it to become fully cured and strong enough to hold your wood piers securely in place. If you try to work any faster, you run the risk of damaging the cement and in doing so reducing the risk of your foundation cracking. After letting the cement cure for the required 28 days, it's time to move onto the next phase. Getting everything ready for your new shed. Now is the time to decide how far off the ground you want the foundation of your shed to sit. Starting with the shortest post, cut it off to match this height. If possible start at one corner and then move to the opposite corner and do the same. Use a two by four laying on top of these to mark the rest of the piers so they can be cut to the right height. As long as your 2×4 is not warped this will give a far more accurate measure than trying to do so by measuring each post. At the same time, if you are using pre-made concrete piers, you will still need to do the same thing to make sure your shed will be level once it is set in place. 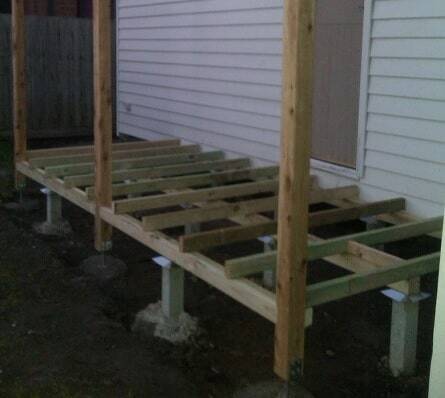 The last part involves creating the final foundation for your shed to sit on. There are two ways you can attach the 4×4 framework to the piers. One is to use metal over the top straps, the other is to uses metal mending plates. Both can be used to bolt the pier to the foundation runner. DO NOT attempt to simply screw the foundation runners to the piers as this type of junction will not provide the necessary amount of structural strength. The 4x4s are the basis upon which you will be building the rest of the foundation for your shed to sit on. All that is left now is for you to build the framework upon which your shed will be laid to rest. Follow the instructions that came with your shed or see our tutorial on building frameworks for your shed to sit on. Which type of pier shed foundation you choose should be based on the land you have to work with, your budget, and how comfortable you are with this type of construction work. Personally, when I built the pier foundation for my shed, I started from scratch with several lengths of pressure treated 4x4s, a load of gravel, and several bags of pre-mixed cement. In the end, I believe this type of pier shed foundation provides the strongest base for most sheds. I hope this information has been useful to you and helps you decide which type of shed pier foundation to build for your shed. If you need more information why not join a Facebook group or check out the many projects on Pinterest. Thank you for reading.